The satellites SPOT 4 (Satellite Probatoire de l'Observation de la Terre) was a second generation of SPOT earth observation satellite operated by Spot Image. SPOT 4 used the improved bus design, which differed from the earlier SPOT series by having an increased lifetime of five years instead of three, a new extended platform design and service module, which can accommodate twice the payload. The propulsion module consists of a frame made of aluminum bars and two capillary tanks holding 158 kg of hydrazine. The prime imaging instrument was HRVIR (High-Resolution Visible and Infrared sensor), which consisted of two pushbroom imaging units, an improved version of HRV. The two spectral modes are panchromatic and multispectral. The panchromatic band had a resolution of 10 meters, and the three multispectral bands (G,R,NIR) have resolutions of 20 meters. 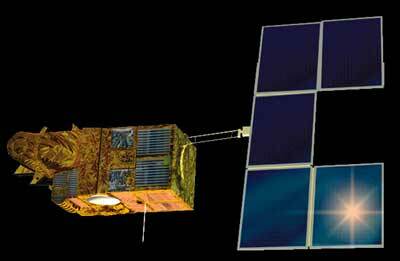 An additional sensor for SPOT-4, called Vegetation or VMI (Vegetation Monitoring Instrument), with a ground swath width of 2200 km, and a resolution close to 1 km, providing the capability of wide-area monitoring of the Earth's vegetation. The instruments features advanced optics that allow perfect geometrical rectification of the pictures despite the wide swath width, as optics virtually cancel the curvature of the Earth to provide directly usable geographical information. SILEX (Semiconductor Intersatellite Link Experiment), an ESA provided experimental optical communication payload built by MMS. SILEX consists of two optical terminals, PASTEL on board of SPOT-4 on the zenith side of the SPOT platform, and OPALE, mounted on ESA's geostationary satellite ARTEMIS. PASTEC (PASsager TEChnologique de SPOT 4), a technology demonstration passenger payload to study the orbital environment. POAM-III (Polar Ozone and Aerosol Measurement) instrument to measure the vertical distribution of atmospheric ozone, water vapor, nitrogen dioxide, aerosol extinction, and temperature. Provided by the US Naval Research Laboratory (NRL), it is an improved version of POAM-II flown on SPOT-3. SPOT 4 was orbited on 24 March 1998 on an Ariane-40 H10-3 rocket. The mission ended on 29 June 2013.